How much does it cost to buy a defibrillator? Having immediate access to an AED (Automated External Defibrillator) in the case of a cardiac arrest can be the difference between life and death. Certain industries such as manufacturing and construction, have been deemed to have a higher risk of cardiac arrest by the British Heart Foundation. Therefore, a defibrillator is an essential tool that all workplaces and areas such as sport centres and properties should consider having on-site. How much does a heart defibrillator cost? Purchasing a defibrillator outright can be a costly process, especially for a small business. Not only do you have to pay out the initial price of £1000-£2000 for a new and up-to-date model, but the upkeep and maintenance is also an expensive factor. If the AED (Automatic External Defibrillator) is used on a person suffering from a sudden cardiac arrest, then it will need to undergo maintenance before it can be used again. This includes a service and the replacement of batteries and pads. It is also recommended that your defibrillator undergoes an annual service to ensure that it is in full working order in case of an emergency. Can anyone buy a defibrillator? For people who have a high risk of cardiac arrest, having an AED in their home can provide peace of mind and will help save their life if an emergency does occur. If you are considering having a defibrillator in the home, ensure it is placed in an easily accessible place and you have someone agile enough living with you to carry out the procedure. Defibrillators are commonly located in workplaces and public spaces, and are known as Public Access Defibrillators (PADs) meaning anyone can use them. You don’t need to be trained to use a defibrillator, as clear instructions are provided with the defibrillator equipment, which enables an immediate, simple and proven solution in the event of a cardiac arrest. However, Defib Machines specialist’s can provide training to industry sectors nationwide, ensuring employees are fully-equipped in case of an emergency. Are AEDs covered by insurance? When purchasing a Public Access Defibrillator, you should contact your insurer to confirm the Public Liability section will provide cover for the defibrillator and cabinet. Public Liability insurance protects a business in case the defibrillator or cabinet causes injury or damage to a third parties property. You can also add for the defibrillator and cabinet to include Theft and Accidental damage cover. Home AEDs are not usually covered by health insurance. There are rare cases in which some insurance companies can help partially cover the cost, therefore always inquire with your insurance company if you are considered to be at risk from a cardiac arrest. One way to avoid all of these expensive fees would be to be to consider renting a defibrillator for your business instead. For just £1 a day, you can provide immediate, potentially life-saving support to a victim of cardiac arrest. 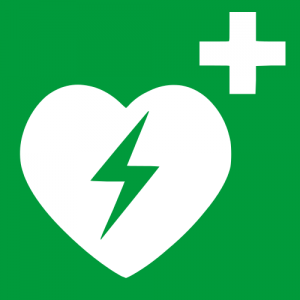 Defib Machines will look after your automatic external defibrillator for you, providing regular health checks on the device and managing the pads and batteries. On top of this, if the device is to ever be used or display an error, it will be replaced with a brand new Defib Machine straight away. You also have the option at any point after 18 months to change your defibrillator for a brand-new device! How Much Does An AED Cost When I Trade In? If you currently own a defibrillator, we also offer a buy back service. Defib Machines will pay up to £250 for your AED and replace it with a brand new one. Find out how to save money when you trade in your old machine. An affordable alternative to the costly purchase of a defibrillator is placated by the option to rent the life saving device for just £1 a day. Go online to choose a defib rental package. If you would like some advice, our team of experts can offer specialist support on choosing the best package to meet your requirements. We only use the latest and most advanced AEDs at Defib Machines, including Lifepak models and the HeartSine Samaritan 360p. Find out which one would be best suited for the workplace by checking taking a look at our range of AEDs for hire. Defib Machines make having a defibrillator on site possible for anyone and remove the mounting costs of purchasing one. 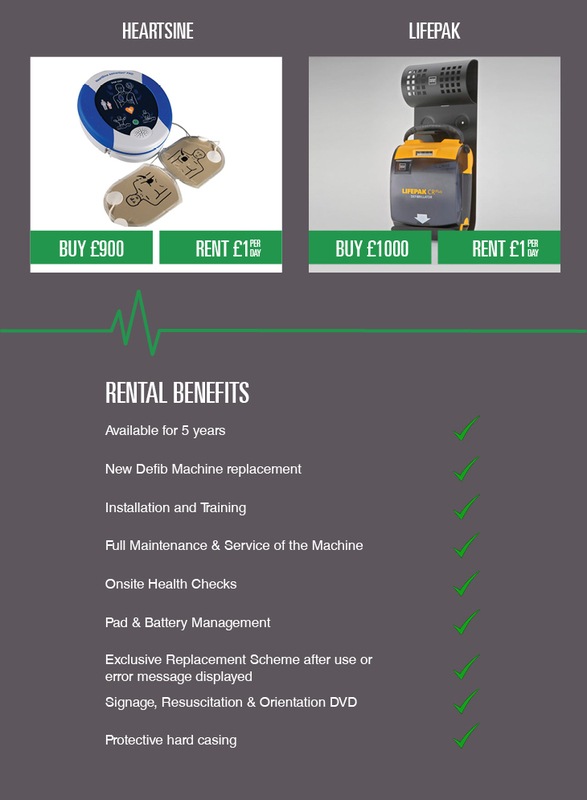 To find out more about our all-inclusive package, contact a member of the team on 0800 0852 733 or contact Defib Machines online and an expert will get back to you as soon as possible.